An elegant wedding reception decoration is a nice compromise between extravagant and discreet accessories while also keeping the cost low. Also, a wedding should always represent the future Mr. and Mrs. definition of love and happiness. 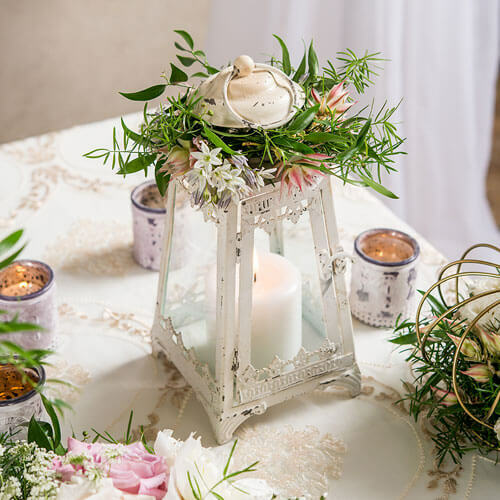 Adding theme related wedding ornaments is a good way to add a personal touch to a classic style wedding. Some people like to bring a vintage, industrial or even rustic feel to a chic wedding. Combining style and tradition is what makes a pretty design become an everlasting trend. 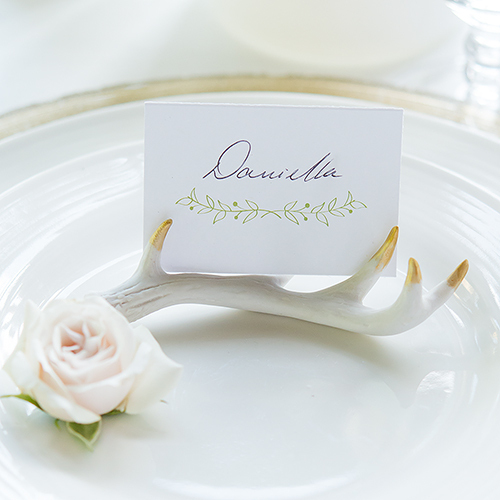 In fact, many accessories have been used for decades to embellish wedding receptions. When creating your own wedding celebration plan keep in mind that elegance doesn’t mean expensive or colorless. 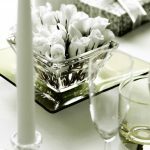 Glass vases, candle holders, and silverware can be paired with many different theme ornements to create a gorgeous and unique decor. The following ideas will help you decorate your big day event in the chicest and stylish way. Also, you ‘ll find many ideas for indoor and outdoor weddings like backyard and beach celebrations. Make sure to read until the end for tips to make the most of your decoration budget. It’s simply impossible to imagine a wedding evening without some kind of ambiance light source. LED light strings can be used to create shapes, suspended over the tables, and can also be added in tulle curtains. A magical delight for your eyes. Damask is a very popular pattern that evokes luxury. It is sometimes used tone on tone but can really create a strong visual impact with contrasting colors as you will see in the following pictures. There are many damask designs to choose from. Some are more heavily detailed or saturated with bold colors others are more refined and subtle. No matter what your preference is you have plenty of choice in the following list of items. This tablecloth adds a lot of character to the wedding tables. It may look overwhelming at first but once the table is properly set with the tableware it looks absolutely sophisticated. This table runner is just enough of the contrast needed to make your tables stand out without stealing the show. It’s a perfect addition to complement a tall vase centerpiece, small chandelier or a set of pillar candles. This chair cover is the best way to turn an ordinary foldable chair into an elegant and inviting wedding accessory. 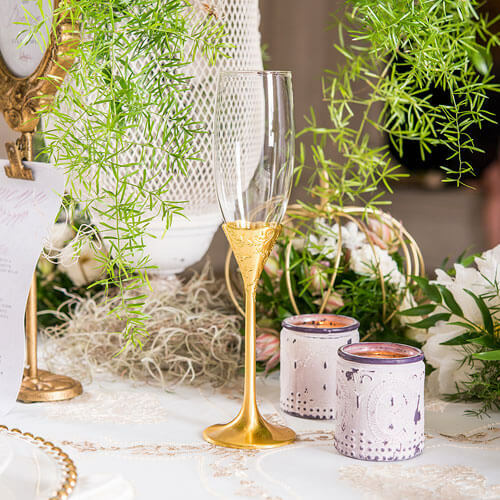 If you plan on choosing subtle ornements for the wedding venue this pattern will provide the table with just the right amount of audacity to make it stunning at a low cost. I’ve featured almost exclusively black and white damask wedding elements. In fact, it’s easier to mix a monochrome damask with the wedding theme color of your liking. Projections are another interesting and breathtaking way to decorate a room for a special event like a wedding. There are many types of projections possible like water waves, stars, and colorful dots. This projector can also follow the music’s rhythm to create an emotional and thrilling atmosphere. Suspended ornaments like these paper lanterns are an effective way to achieve an impressive wedding venue decor without breaking the bank as they often come in multipacks. The best way to make the most of any detailed and contrasting accessory is like these is to mix them with plain a lanterns to create a defined but not to overwhelming or distracting effect. The effect is quite impressive. These are available in many sizes like 3×3 in. , 3×6 in. and 3×9 in. The candles are embellished with rhinestones and can also make a great guest favor. What’ s a party without balloons? These are totally suitable for a wedding with their foil accent colors, pearl finish, and intricate, refined patterns. If you plan to have a photo booth or simply want a place where your guests can take pictures with you a backdrop is often the best option. The backdrop is also a great alternative if you cannot take pictures outside due to bad weather or in the evening since it’s too dark outside to take nice pictures. Moreover, you can simply set it up in a small unused space at your wedding venue. Stylish garden weddings are no longer a rarity. And for a good reason. If you have been to a wedding fair in your city lately you probably found that a wedding can cost an arm and a leg, so to speak. It’s no secret that the biggest chunk of money is usually spent on food and venue rental. While I think it’s better to invest money in long-term projects, I really can’t deny the importance of having a beautiful wedding that meets your expectations. The good news is that you will save a lot of money by having a backyard wedding. But be careful: it means you’ll have to plan wisely. In fact, the venue is one of the highest expense along with catering due to the number of guests (among other things). If you have space, helping friends with crafts and cooking skills, chances are you will have an amazing backyard wedding. Here are some budget-friendly backyard wedding ideas that will surely help you plan a perfect family and friends gathering. Renting may seem like the best option for many aspects of a backyard wedding. However, it may turn out to be much more expensive than buying certain things. Furthermore, this is true for anything that has to do with decorations and reception tableware. There are different options for an outdoor or backyard wedding that can really help you keep your budget low without being stuck with 150 utensils, chargers, plates, glasses, paid full price. Wedding structures like the following one are cheap when compared to the bulky wood-made arbor and can be decorated with a wide range of materials. There are many artificial flower and greenery garland available to make this a splendid wedding ceremony arch. An outdoor wedding can sometimes be confusing for the guests. This is because in a typical wedding venue all directional information is taking care of by the venue staff. In a backyard wedding, you will most likely need to inform wedding attendants about various things and also assign someone to help them. These built-in loop light string are a must to create a beautiful cozy atmosphere during evening festivities. Install these inside the wedding party tent or hang them to trees for a magical fairy-like scenery. This string is 48 feet long and each bulb has a hanging hole for more convenience. They are waterproof and can be interconnected. Although reusable tableware is the most ecological option there are interesting alternatives you can look at. An important thing to keep in mind is that while outdoor weddings are lovely, you will need to clean up once the party is over. Vegetal plates and utensils are a great way to minimize the impact of the waste dumped into nature. Some are made of bamboo or palm leaves and don’t contain unhealthy dyes or bleach and are 100% compostable. 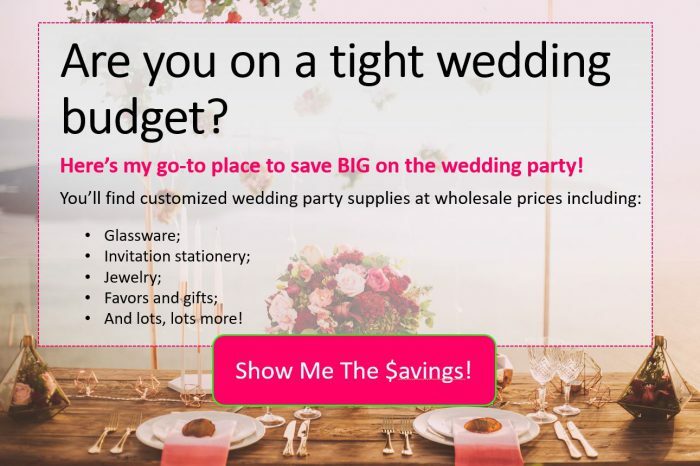 Use Facebook to find other brides who live nearby and want to sell their wedding accessories once their wedding is over. These private groups were set up by people like you and me who want to share and benefit from other brides experience. You can join for free and ask for references and see what people are selling. 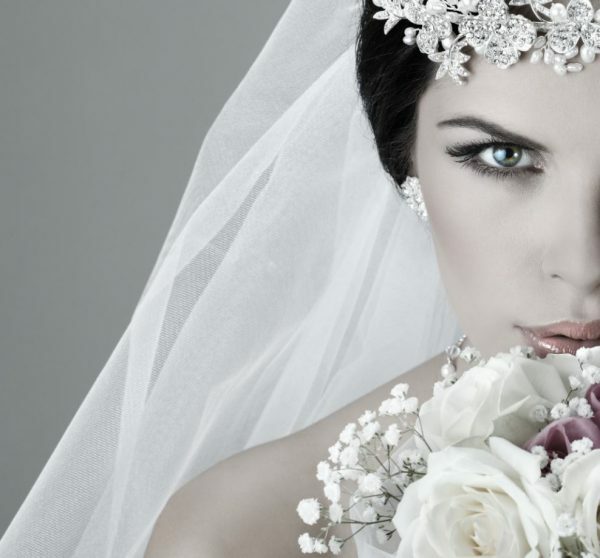 At the end of summer, many brides post pictures of the items they want to share and how much they ask for it. As a matter of fact, there are big savings to be done so keep an eye open. Big stores like Bed Bath and Beyond and Macy’s have good deals for tableware around Thanksgiving. If you have the storage space this is a great saving strategy. I suggest not to wait for after Christmas sales to make sure you’ll find as many units as you need. 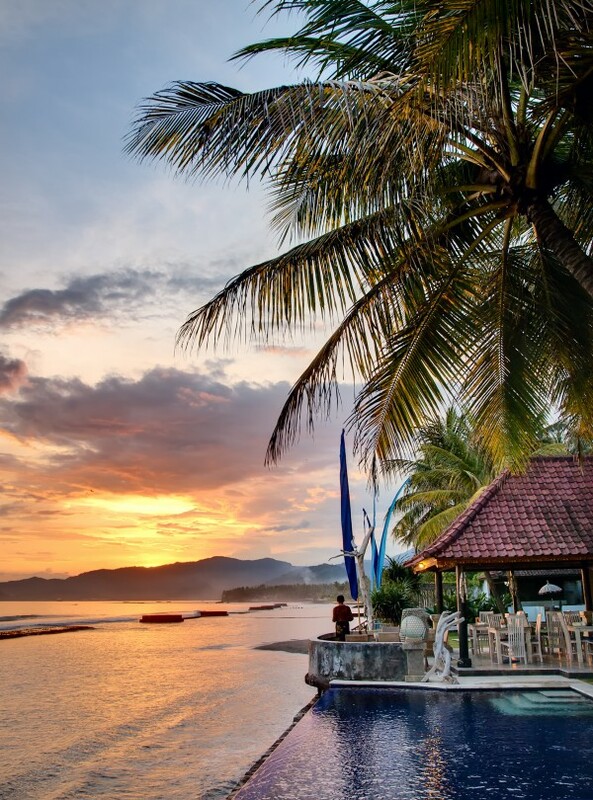 A beach wedding is usually less formal than a traditional one. The sand under your feet, the intimacy of a small audience of guests and the breathtaking sea panoramic view conveys such feeling. Why not take advantage of this and introduce into your very own wedding uncommon elements that you wouldn’t probably think of for a solemn and strict wedding? This is a great way to add a personal touch to it. Here are my simple beach wedding decorating ideas suggestions to make this day unforgettable. I hope you’ll like them! 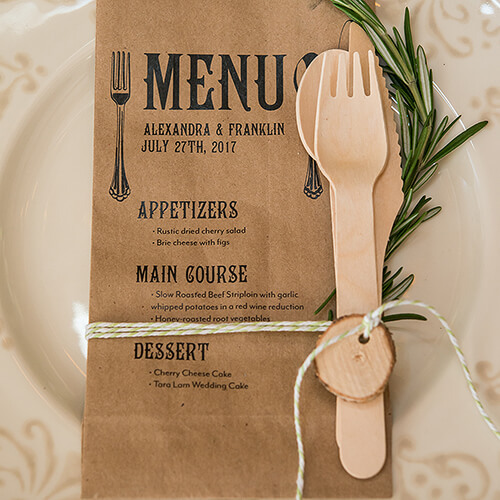 First of all, if you are somewhat crafty and have some time to invest in a do it yourself project then you can easily make your own table centerpieces, creative wedding invites and pretty guests favor packaging. Plus there are steps by step project tutorials you can take advantage of on the Internet. But what’s really going to save you hundreds if not thousands of dollars when you have 50 guests or more is to buy in bulk. Wholesale sellers are very popular in the wedding industry and they don’t sell exclusively to retailers. many of them are offering their products on Amazon and other large online retailers. Actually, make a quick search for whatever your needs are on one of those sites and see what results come up. Simply type in: wedding “item name” wholesale. The wholesale price is considerably lower than the price you’d pay if you bought them separately. You can find online a vast selection of pretty much anything you can think of and often at a discounted price. Gone are the days where you’d have to go physically visit each store to compare prices. Nowadays, you can prescreen your wedding supply and decoration needs to save both time and money. Another benefit is that you can find everything in one place. Many retail chain stores now have a centralized inventory allowing them to ship the 80 ivory lanterns you ordered online directly to your doorstep. What you may not know is that many of these come from their different stores located in different cities. Not so long ago customers who needed 80 gold charger plates had to ask the manager if they can verify in another store if they had enough units. On a personal note, I love to browse on Pinterest and use it a lot to pin ideas I want to be able to refer to in the future. There is one problem though. When you start looking at the gorgeous and often extravagant decors on those websites you must keep in mind that these are often fake pictures. In fact, such grandiose looking weddings can cost a small fortune. More often than not, the picture is staged and the photoshoot was paid by a merchant that wants to sell a specific service or product. That’s why finding inspiration on Pinterest and other visual social sharing platforms is a good idea but trying to replicate them is not. Instead, try to determine what grabs your attention most in those perfect pictures. It can be a color scheme, specific theme or the originality what was used to create it. 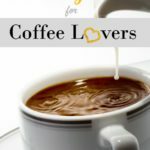 I hope you enjoyed reading this post. Let me know if you have any questions by leaving a comment below.